"There are many people in America that realize that drugs only treat the symptoms, not the causes of a disease. Why would a company even bother to research treating the symptoms of a disease instead of attempting to find a cure for the disease? Does anyone ever ask that question? Well, a lot of us do, but not the FDA. The answer is, so long as you are treating the symptoms, you won't cure the disease and you can go on selling that drug until the person dies." 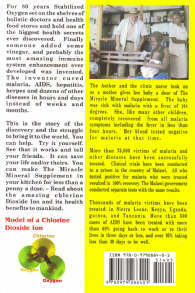 ometime in June of 2006 I was approached by a close friend of Jim Humble, a man who had recently relocated to Mexico and had spent several years researching the benefits of chlorine dioxide. The medical effects of ClO2 are well-established and have been used by various medical practitioners around the world for well over a century. What authorities found most threatening about Jim Humble's message, however, was not the product it revealed. It was the message itself. You can make the product yourself -- in 3 minutes -- using either USP-grade sodium chlorite you purchase directly from a chemical supply house, which you cook into a preparatory solution with just water . . . or you can purchase the solution pre-made. Either way, it's quite inexpensive. What's more -- it's very effective. I had a chance to speak with Jim directly a few times before Cathryn and I left for Ecuador. The political intrigue that has followed him since he made his discovery and conducted highly successful clinical tests in Africa is the stuff from which Hollywood movies are made. But don't expect anyone in the mass media to tell Jim Humble's story any time soon. No . . . make that any time --- ever! Instead . . . we recommend that you discovery the benefits yourself and then you'll have your own story to tell. 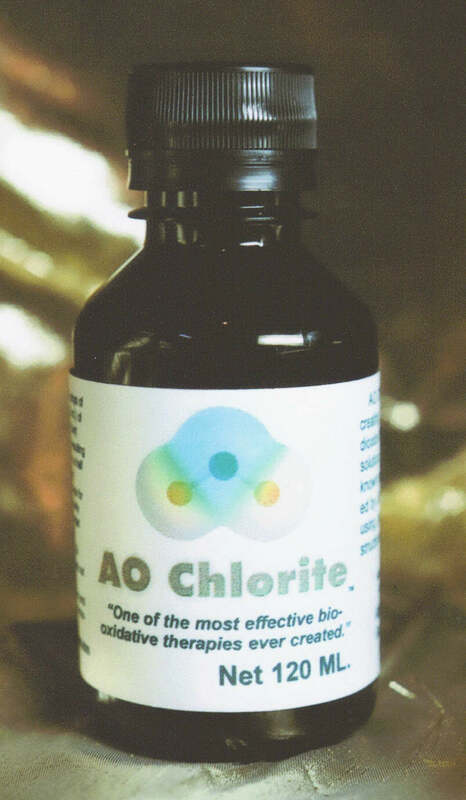 A word of caution: The effects of MMS -- (which we sell under our trade name, AO Chlorite -- the same 28% sodium chlorite solution that Jim tells you how to make in his book) -- are very dosage specific. The first time I prepared the product personally, I used 5 drops in a teaspoon of apple cidar vinegar. That was too much. I ended up flat on my back for an entire afternoon because the Herxheimer effect from the microbial die-off was more than I could comfortably handle. What Jim recommends -- and I can see his point -- is that you start out using just one drop, prepared by adding just a half to one full teaspoon of vinegar -- and then gradually increase the dosage, depending on the condition you are attempting to self-administer. Furthermore, we recommend that you purchase the book before it is banned -- just like the product itself is currently reported as being banned in certain countries. (See advisory below). On September 30, 2008, we received an email from Dennis Richard -- who reported that the governments of both Australia and Canada had moved to ban MMS (which is identical in its content and preparation as AO Chlorite. We will keep our customers appraised of developments concerning the legal status of sodium chlorite solutions for medical use. Recommended Video Shorts on "MMS"
We have our own protocol, which has been developd over time using AO Chlorite with H3O. Still it is instructive to see Jim Humble's presentation of his various protocols. Is MMS As Dangerous As the FDA Says It Is? [Extreme Radio Interview #102 -- (2013) ] --- Interview with Jim Humble, who addresses the FDA's official position. Lyme Disease 100% Cure Found (2011) -- This video has nothing to do with MMS, but we found this video (which is cut off at the tail end) to be helpful as it relates to nutritional supplementation for those with Lyme's. Worth watching if you have this condition. Many more videos exist on both YouTube and Google Video on this very important subject. 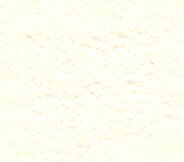 Most of them can be accessed by entering "MMS" into the search field. After speaking with Jim by phone in 2006, I began investigating his claims before Cathryn and I left for Ecuador -- and although Humble's delivery and product claims may seem hyperbolic, we have found in working with variations of MMS that the bulk of what he says stands up well to scrutiny. click photo to enlarge) Amazingly, the bulk of Jim's work is just common sense applied to hornbook chemistry. After all, the properties of chlorine dioxide (Cl02) and the manner in which it is quickly created with aqueous sodium chlorite are well-established. Its medical properties as a powerful pathogen killer -- among bacteria, viruses, and parasitic amoeba -- are well-known. Properly taken, chlorine dioxide stands within the ranks of other powerful, oxidating microbicidals, some of which we have written ourselves on this site, including hydrogen peroxide and ozone (as found in Quikheal). We ourselves chose the name AO Chlorite -- because, although more esoteric to those unfamiliar with the chemistry, it is more accurate. (The product name, MMS (Miracle Mineral Supplement) gives the impression that it is a mineral that acts as the curative agent -- when, in reality, it is the oxidative process initiated by the oxygen side of the ClO2 molecule in the finished preparation). In addition to its availability on Amazon, Jim Humble's book can be purchased from the book's dedicated website -- and the product itself has been available in 4 fl. oz. bottles from an associate site. Among the many people I have met in this business, I have yet to meet a more selfless, tireless individual -- whose focus is empowering ordinary people with yet another simple cure that has been sitting under our noses for well over a century. Word about what this product is and what it does is going to cost Big Pharma untold billions before it's all over. What to do? . 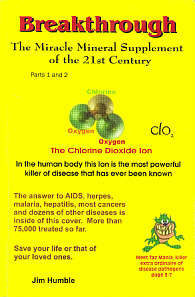 . . with all these hundreds of thousands of people worldwide who already know what sodium chlorite solution is, what it does, how to make it, how to use it, and how it has been suppressed? Update on Preparation: ACV (Apple Cidar Vinegar) and citric acid solution have been, to date, the most common "activators" for MMS. However, we have found that H3O, (which we also call "Calcium Sulfate Hydronium Concentrate"), in some respects works better, while reducing instances of nausea. You simply take a small cup --- (one that will accommodate at least 4 fl. oz. of fluid) --- and then drop in your target dosage (normally anywhere from one to fifteen drops) into the cup, followed by an equal number of drops of H3O (the amount does not have to be exact) and allow a minimum of fifteen seconds to react. Following this reaction, simply mix in about four oz. of water or juice, then drink.